In the empty immensity of earth, sky, and water, there she was, incomprehensible, firing into a continent. Pop, would go one of the six-inch guns; a small flame would dart and vanish, a little white smoke would disappear, a tiny projectile would give a feeble screech – and nothing happened. 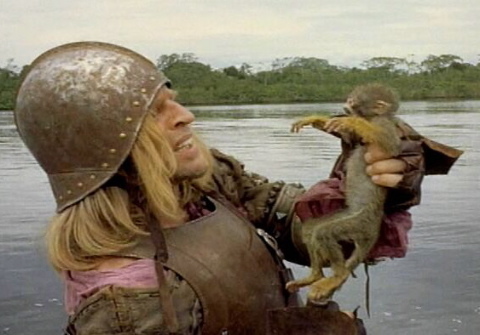 Aguirre: the Wrath of God is one of those movies that has almost become more famous for what happened on the set than what happens on screen. The tempestuous relationship between the young German director Werner Herzog and his wildman star Klaus Kinski is notorious and the story of how Herzog ended up threatening Kinski with a gun to get him to behave has been well rehearsed; there’s little point in going over it all again here. Of course the parallels are irresistible: Europeans struggling to adapt to the tropical terrain; a mission hijacked by an insubordinate madman; problems communicating with the locals; logistics from hell. We could just as easily be talking about the making of the movie as the movie itself. Even some of the shots blur the boundaries between art and reality. We see Inez (played by Helena Rojo), for example, stripped down to her corset, perched on a rock, idly swishing a long-stemmed flower over the ground. Are we watching the mistress of the leader of a Spanish scouting party, alone with her thoughts? Or Rojo chilling out between takes? Or both? It’s moments like these, and there are many of them, that lend an air of documentary realism to the film. Herzog’s camera becomes a member of the conquistador crew, albeit one that observes their antics dispassionately, drinking in every detail of their self-destruction, in a series of calm, measured, almost listless, takes. Yes, there are bursts of action and violence, but they’re brief and the expedition soon regroups and continues its leisurely passage. Indeed, so serene and strange are some of the images – a masked horse afloat on a raft, a ship up a tree – and so languid and long some of the shots, that it lulls the viewer into an almost dreamlike trance. Images are what I remember most clearly. They’ve burned themselves into my brain. In particular is the slow descent (foreshadowing the descent into madness to come) that opens the movie. A host of sixteenth century gentlemen in their doublets and breastplates (a couple of ladies too, in stiff velvet gowns and stiffer lace ruffs) pick their way slowly down the side of an Andean mountain. A Renaissance court, entire and intact, picked up and plonked in an utterly alien landscape. In that tropical climate, it must have been sweltering. Around them are servants and slaves carrying treasure and plunder and signs of the sheer absurdity of the mission: a sturdy cartwheel, useless on such terrain, is strapped to some poor native’s back. There’s no clearer symbol of the hubris and folly of imperial adventure. The film’s thesis is not a difficult one to parse. The conquistadors are exposed as greedy privateers, the monk who acts as the film’s narrator a canting hypocrite, the native people and the expedition’s black slave are piteously oppressed. Balthasar, the mission’s interpreter, was a prince among his people until he was dispossessed by the conquistadors, he tells Aguirre’s daughter. There are echoes of The Tempest’s Caliban in the way he resents his acquisition of the conquerors’ language (“You taught me language, and my profit on’t is I know how to curse”). Okello the black slave (surely another nod to Shakespeare) fantasises not of riches, but of freedom. 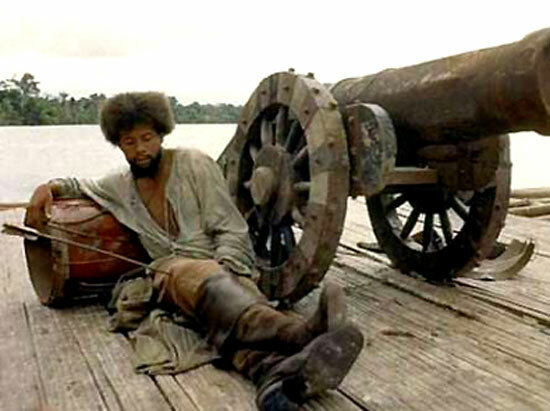 I don’t know whether Herzog ever read Heart of Darkness (like The Tempest, an established narrative of colonialism), but it’s not hard to see its influence – the scene of the Spaniards’ makeshift raft firing its cannon into the jungle, a gesture both futile and delusional, recalls almost exactly the quote above. And indeed Aguirre is a very clear and acknowledged influence on the later film Apocalypse Now, Francis Ford Coppola’s take on Conrad’s tale. But this is a German film, so perhaps we should look to Germany and its own disastrous twentieth century flirtation with imperialism. I’d never considered it before, but Aguirre is an obvious Hitler figure. Just consider the rhetoric of his climatic speech, which Kinski barks out in staccato bursts. It’s pure Führer. Herzog, born in 1942, lived through decades of both denial and denazification before the watershed generational reappraisals of Nazism of the late sixties. It’s not hard to see Aguirre as his comment on the figure of Hitler and the legacy of the Third Reich, refracted through the lens of Spanish colonialism. A journey to nowhere. A madman on a sinking raft, ranting at monkeys. 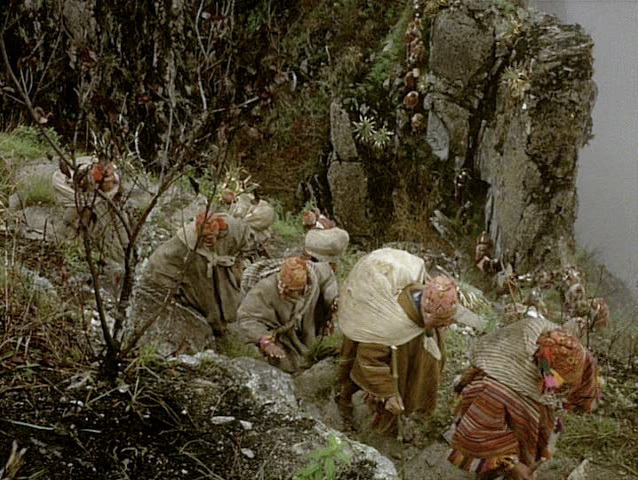 A new restoration of Aguirre: the Wrath of God is currently showing as part of the British Film Institute’s Werner Herzog season. The film is also showing in cinemas nationwide from Friday 7 June.